It’s likely you are revving up for this holiday season’s festivities with as much spirit and drive as Santa himself. You’ve found the perfect tree. The holiday bins and boxes are being pulled out of storage, filled with all the lights, tinsel, ornaments, and décor that will transform your home into a glittery wonderland. And just like Santa’s reindeer, your pets want to play a role in the magic of the season. To keep your holiday prep stress-free and packed with fun, we have prepared a complete list (and checked it twice) for keeping your furry family members safe among all your holiday decorations and celebrations. Download and share this guide on your social networks to help others keep their pets safe as well. 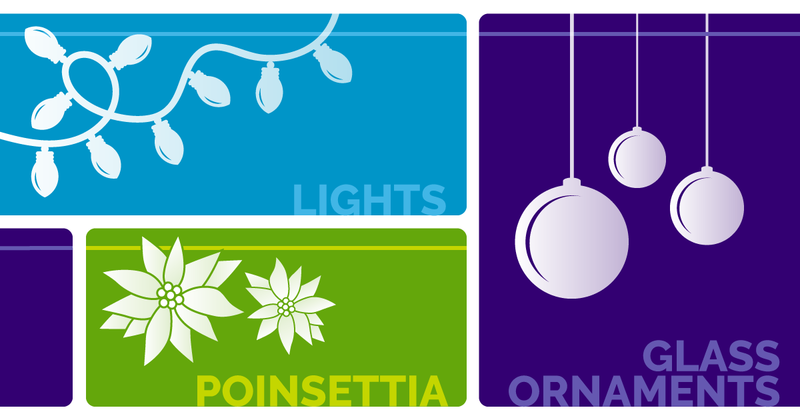 Deck the halls, but be aware of your greenery! Holly, mistletoe, lilies, poinsettia, and amaryllis plants are poisonous to both dogs and cats. If you can’t resist these plants in your decorating opus, they should be out of reach for all pets. All is calm, so be mindful of loud noises. Champagne bottles popping, Christmas crackers, and other noisy surprises can be especially traumatizing for dogs. Just like thunder and fireworks, make sure your dog is not caught off guard. Take them to a quiet, cozy place before you sit down to dinner. Keep the bowls of candy out of reach, and no chocolate or nuts- ever! Chocolate is toxic to pets. It contains a substance called theobromine, which dogs and cats should never consume. And the higher the cocoa content, the more toxic the chocolate will be. Additionally, macadamia nuts and walnuts are highly toxic for pets. They could cause severe lethargy, vomiting, fever, tremors, joint stiffness, and could make it impossible for your pet to walk. Avoid sharing those table scraps and overindulging your pet. Fatty meat trimmings, bones, and alcohol can all be dangerous to your pet’s health. They can cause serious illness – everything from vomiting and diarrhea to comas and seizures and stomach perforation. Other foods to be cautious of are garlic, onions, grapes, raisins, and avocado – these can cause lethargy, loss of appetite, and vomiting. Also, artificial sweeteners are very dangerous for pets to ingest, as they contain xylitol, which can be lethal. Safe wrapping, safe pets. Presents looks so lovely under the tree, but make certain there aren’t any bows, ribbons, or string that your pet will want to play with. These can always be added last when you have time to supervise your pet. This goes for the unwrapping part too! Make sure you have a big garbage bag handy to place the gift paper in once everyone is finished unwrapping the gifts. Give pet-approved gifts. When shopping for your fur buddy, get toys from a reputable pet store or animal hospital. And steer your pet away from playing with children’s toys. All is bright, so prevent fire hazards. While candles provide a warm glow to your home, they should be placed on high shelves or mantels, out of your pet’s sight. If your dog is as happy as mine, a wagging tail can lead to a clumsy accident. When gearing up the sleigh, travel safely. If you are traveling with your pet this holiday season, always make sure your pet is secure. There are now small car seats on the market that securely seatbelt in your car for small dogs. Large dogs can be kept in a size-appropriate crate with blankets or their bed. Cats should always be in a cat crate with soft blankets. And always be mindful that pets need bathroom breaks too! Keep a normal routine with your pets. We all know how chaotic the holidays can get, so keeping as normal a routine as possible for your pet is key for their comfort and reducing any anxiety. If you are hosting, designate a quiet and cozy place for your pet to retreat to, and announce it to your family and small children so they know not to disturb your pet if it is in its cozy spot. Take winter walks with your pup. In keeping a normal routine, this means taking your dog for winter walks, and sometimes it is snowy and icy outside. Make sure your dog is warm enough. Veterinarians recommend a dog sweater or coat to help keep them dry. Salt used to melt snow and ice can burn your dog’s paws. Veterinarians recommend protecting them with dog booties or using pet safe balm. And always dry your dog with a towel when you come inside, paying special attention to the paws. A dry dog is a healthy dog. Giving pets as gifts is a firm NO. Pets are a lifelong responsibility and should only be given as gifts to those who are ready to offer a lifetime of love and care to a new furry friend. We encourage you to go all out in turning your home into a winter wonderland this season, but remember, all the holiday action and adornments can be overwhelming for animals. By keeping these comprehensive and useful safety tips in mind, your beloved pets can join in all the holiday fun this year! For informational purposes only and may not be applicable to all situations. Medical decisions for your pet should be made in consultation with a veterinarian. Pet health insurance is administered by Embrace Pet Insurance Agency, LLC and underwritten by one of the licensed insurers of American Modern Insurance Group, Inc., including American Modern Home Insurance Company d/b/a in CA as American Modern Insurance Company (Lic. No 2222-8), and American Southern Home Insurance Company. Coverage is subject to policy terms, conditions, limitations, exclusions, underwriting review, and approval, and may not be available for all risks or in all states. Rates and discounts vary, are determined by many factors, and are subject to change. Wellness Rewards is offered as a supplementary, non-insurance benefit administered by Embrace Pet Insurance Agency in the United States. American Modern is a widely recognized specialty insurance leader that delivers products and services for residential property--like manufactured homes and specialty dwellings--and for consumers in the recreational market, including owners of boats, personal watercraft, classic cars, motorcycles, ATVs and snowmobiles. For more information, visit www.amig.com . Earthquakes Can Happen Anywhere. Are You Ready?